Heavensward is an expansion pack for FFXIV. You must have complete the main scenario quest - Before the Dawn - to gain the acess. From Heavensward, you can start to upgrade from level 50 to 60. This guide is to give some useful tips to help you reach the level cap efficiently. There are lots of side quests scattered through the new areas for you to complete. You can gain rich rewards like exp and new equipment from them. Some important side quests chains start in Ishgard and it is suggested to complete them. However, in order to reach the level 60, side quests are not enough for exp. From level 53, you can start doing daily Hunts which provides a significant amount of exp and centurion seals. Some additional hunts become available at levels 56 and 59, each being repeatable daily. Hunts can be unlocked by speaking to Aytienne in front of the Forgotten Knight pub in Ishgard. Besides, you can complete some FATEs to get exp. It is not suggested to grind solely on Heavensward FATEs. And you will be given the choice to do Temple leves which cost 10 leve allowances but offer roughly twice as much exp for rewards. It is more efficient to stick to the normal levequests if you are constantly using each allowance. At every odd level starting from 51, five new leveling dungeons in total become available. The level 51 dungeon is optional and is unlocked by a side quest in the Coerthas Western Highlands. It is suggested you upgrading your second job use them to grind as these dungeons provides high amount of exp and gear rewards. Also, you can find sightseeing log which offers exp for every vista you locate. However, this is not an efficient method to gain exp. You may receive the exp bonus while standing on the glowing spot. Also you can participate in level 50 FATEs, various Duty roulettes and the challenge log for extra exp, which makes your journey easier. You can buy FFXIV Gil to purchase good weapons for you fighting monsters! Below are some tips for your way to level 51 to 60. 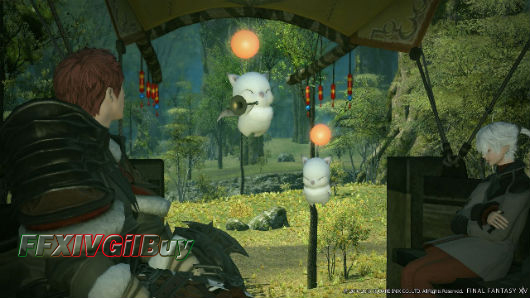 Flying is introduced to FFXIV Heavensward as a new means of transport and the new areas are made with the new feature. Therefore, it is recommended you unlock the ability to fly in each area to make it easier to complete quests and join in activities like FATEs and sightseeing. You can collect Aether Currents to unlock Flying. After having attuned to every current in an are of which there are 15 in total, you can fly using the various flying mounts available. You can gain currents from certain quests or found them in the field using an Aether Compass. If there is a particularly tall structure nearly, you will get chances to find a vista at the top. Besides, when running dungeons and FATEs, food can give you a 3% exp bonus. Having your chocobo companion out in the field speeds things up tremendously as monsters are stronger than before. You may get a slight penalty to your exp from monsters. And the increased kill speed will more than make up for it. Make sure to unlock the ability to fly with your companion from the level 52 quest - I Belive I can Fly- for the extra convenience! Since the ability to fly makes it much more efficient to complete the expansion contents, especially the sidequests, players should prioritize completing the main scenario and sidequests up to the point where they can receive all the Aether Currents before tackling the rest of the quests in the area. At later levels, more side quests will be unlocked in the previously visited areas. Some late-game dungeons like the Neverreap in Sea of Clouds, are also inaccessible without Flying. During odd levels, leveling dungeons provide the best exp as you can take benefit of the exp chain system. Hope this guide can be helpful for your level 60.